Do you eat more when you're stressed? You're not alone. According to a recent national survey, more than one-third of the participants said they change their diets during times of stress. And unfortunately, most of us don't reach for a carrot when we're stressed -- we go for refined carbs and sugary foods. "When we feel stressed, we seek foods that are going to comfort us immediately, but often times those foods lead to surges and crashes in hormones and blood sugar that increase our susceptibility to new stresses," says David Ludwig, a professor of pediatrics and nutrition at Harvard University and a researcher at Boston Children's Hospital. The key to coping with stress is eating foods that don't exacerbate our response to stress, like refined carbs and sugar, but rather make us more resilient. For example, blueberries are high in anthocyanins, an antioxidant that helps calm the nerves. "It helps to stabilize your blood-sugar levels and it gives you a more stable energy thoughout the day," says Amy Jamieson-Petonic, a registered dietician at Cleveland Clinic. A key nutrient for supporting emotional health is the omega-3 fatty acids found in fish, says researcher Joe Hibbeln of the National Institutes of Health. "One of the most basic ways that omega-3s help to regulate mood is by quieting down the [body's] response to inflammation," he says. "You can either be good at weathering stress or you can be brittle. And omega-3s make your stress system more flexible." Salmon, tuna, and sardines are good sources of omega-3s, as well as flaxseed and chia seeds. Stress depletes your vitamin C level, so it's important to eat lots of C-rich fruits like oranges, kiwi, grapefruit, and pineapple as well as veggies like broccoli, spinach, and squash. 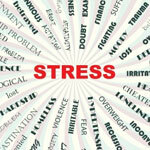 Stress also depletes the body of B vitamins, which the brain needs to maintain healthy nerves and brain cells. Replenish B vitamins with avocados or a handful of mixed nuts. It may not be as comforting to some of us as a slice of pie, but a spinach salad can help replenish magnesium when you're stressed out. Spinach is packed with this important mineral, which helps regulate cortisol, the body's stress hormone. Sprinkle some pumpkin seeds on top -- they are also rich in magnesium as well as zinc, which will help boost immunity. Most of us don't need scientific evidence to convince us to eat more chocolate, yet research shows that, when consumed in moderation, dark chocolate can help support a healthy mood and reduce stress. Eating 1.4 ounces daily for two weeks is associated with lower levels of the stress hormone cortisol. Look for dark chocolate that is at least 70 percent cocoa.